Parenting experts and dermatologists stress the importance of protecting your kids’ skin from the sun, and there’s no question why. Overexposure to UV rays can cause premature aging and skin cancer, and while we usually associate these conditions with older age, taking care to protect your kids’ skin now can help them avoid these repercussions later in life. Babies younger than 6 months old should be kept out of the sun altogether, since they have such sensitive skin. Their immature skin and higher surface area to body weight ratio put them at risk of developing side effects from ingredients used in sunscreen¹. Babies also have less melanin, which means their skin offers less natural protection against UV rays². So what should you do when you’re outside with your little one? The FDA encourages using protective clothing and hats, and creating shade with umbrellas or covering your stroller. When doing so, be careful that your baby doesn’t overheat¹. For kids over 6 months old, sunscreen should always be applied². 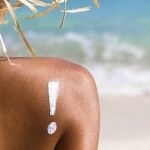 Try to make sun protection a habit from the get-go. 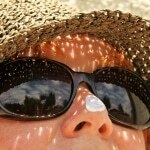 This isn’t always easy, so if you have older kids who fuss when it’s time to apply sunscreen, you can try a few techniques to make sun protection less of a hassle. Take care of sunscreen application before you leave for the beach or soccer practice, so that no waiting is involved once you reach your destination. You can also let your kids apply sunscreen to you before you apply it to them. Lastly, if your kids are old enough to understand, let them know about the risks of premature wrinkles and skin cancer to show them why sun protection is so important³. Once they’re old enough, you’ll be able to trust your kids to apply sunscreen on their own. Check whether or not the sunscreen is flammable (especially the spray kind) and if so, make sure your child knows not to apply it near open flames or other heat sources⁴. Also, teach them the BEENS acronym (back of knees, ears, eye area, neck, scalp) so that they don’t miss any important spots while applying sunscreen⁵.